Leadership and Soulitude - Love makes a leader a Leader. Do You Lead as Love? Love makes a leader a Leader. Leadership is the qualities of character and mind that makes us worthy of the trust of others. Solitude – Soulitude – is the most important necessity of true Leadership. Many people we call “leaders” are those who simply make it to the top. They are people who can climb the greasy pole of whatever hierarchy they decide to attach themselves to; they are excellent sheep who conform and follow along in loyalty to win the approval of those above them. They are people who spend their lives scrambling for status, privilege, entitlement, power, control, and wealth. They keep the routine and false narratives going and originate nothing. They sell out their Souls and so lose their Sovereignty, FreedOM and Integrity as human beings. Our “leaders” are the mediocrities. Excellence isn’t usually what gets you up the greasy pole. What gets you up is a talent for maneuvering. Kissing up to the people above you, kicking down to the people below you. Pleasing your teachers, pleasing your superiors, picking a powerful mentor and riding his/her coattails until it’s time to stab him/her in the back. Getting along by going along. Being whatever other people want you to be, so that it finally comes that you have nothing inside you at all. Not taking stupid risks like trying to change how things are done or question why they’re done. Just keep the routine going. What is rewarded above all is conformity and compliance. 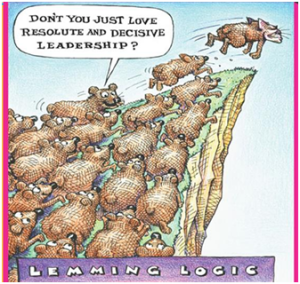 Leadership means finding and establishing new directions, not simply putting yourself at the front of the herd of lemmings that’s heading for the cliff. These beliefs are driving choices and actions that strive and fight to preserve this regressive, repressive ideology and agenda. What the majority of us see as dishonest, manipulative, exploitative, and corrupt is valued as what matters and takes precedent as the way things “should” be to conserve power, control and wealth. They can answer questions within this false narrative, but don’t know how to ask questions that open us to new possibilities. They can fulfill goals within this false narrative, but don’t know how to set us on a more constructive, mutually beneficial path. They can think about what gets done within this false narrative, but not whether it should even be done or done differently. What we don’t have are Leaders. In other words, what we don’t have are thinkers. People who can think for themselves. People who can formulate a new direction for the country, a new way of doing things, a new way of looking at things from a cultural and societal perspective based on the wisdom of evidence and experience. We have the Constitution that defines our ideal social contract as citizens and shared values of equality, equity, shared power, justice, dignity, well-being for all. Yet most of us disregard our personal responsibility and accountability to make this reality for ALL. Standing for our shared national values is Leadership. All the more so now. Anyone who’s been paying attention for the last few years understands that the changing nature of the world means that those in leadership roles are required more than ever to be able to think independently, creatively, flexibly. To deploy a whole range of skills in fluid and complex situations. People who know how to do more than follow orders and execute what they already know. What makes us all Leaders is precisely that we are able to observe, look for factual evidence and think things through for ourselves that includes benefits for all others and so derive wisdom from our collective experience. And because we can, we have the confidence, the courage, to argue for ideas even when they aren’t popular. Even when they don’t please those above and around us. Wisdom gives us moral courage; the courage to stand up for what we know is true, good and right for our common, public benefit as citizens. Standing for our nation’s ideals as Leaders is both uncomfortable and inconvenient. What are you doing as we are confronted with our national situation of contempt for our Constitution by those holding national, state and local offices? Are you remaining silent to “play nice”? Do you have the courage to do what is right? Do you even know what the right thing is? Will you find the strength and wisdom to challenge what is happening in this nation? It’s not easy. In this polarized, volatile time, it’s perfectly natural to have doubts, or questions, or even just difficulties. The question is, what do you do with them? Do you suppress them, do you distract yourself from them, do you pretend they don’t exist? Or do you confront them directly, honestly, courageously? If you decide to do so, you will not find that the answers to these dilemmas on FB, Twitter or even in The New York Times. They can only be found within — without distractions, without peer pressure, by listening to your own Soul, in Soulitude. In doing so, your find YourSelf and become a Leader. Leadership is Integrity: Integrated Wholeness of Body, Mind, Heart, and Soul. Democracy is collective Leadership. At its essence, as citizens our Leadership is Soulitary Work: Leadership requires the Truth of Spirit that only our Sovereignty of Soul Knows. In the end, it will be our Leadership of human progress in our evolution towards our Destiny: Life as Love. Our fundamental values/ideals as a nation and rights as human beings will prevail. let's make it go viral! Leading as Love® Lucira Jane Nebelung Copyright © 2014-2018. All rights reserved.